What Does Print Aura Use Your Mockups For? 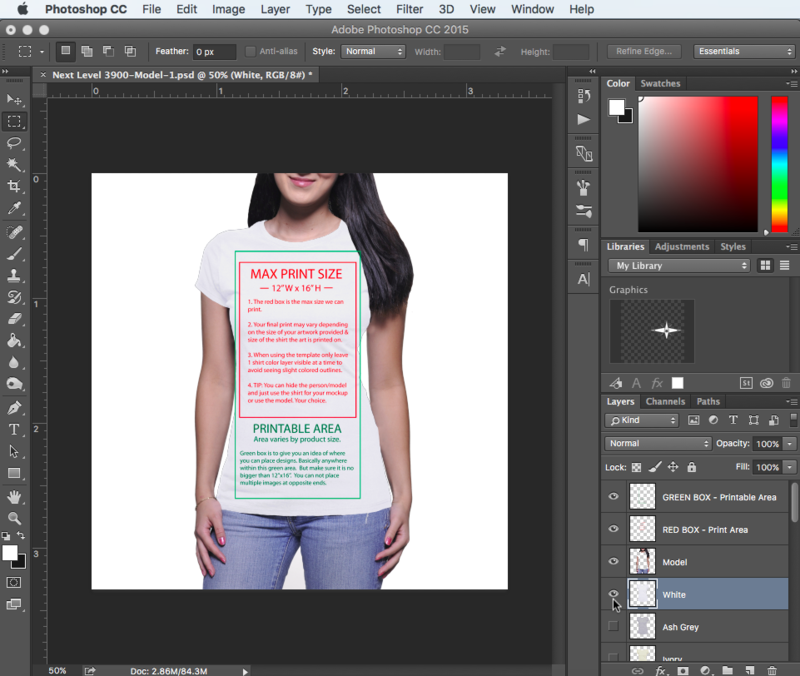 We look at the mockups you submit to figure out where you want your design placed on your t-shirt. Contrary to popular belief, we don’t look at mockups for image sizing. Keeping your artwork a similar size to the actual size of your image helps with accurate placing, but we will not re-size your artwork based on your mockup. Did you know you don’t have to use our mockup tool to create a mockup? We created the mockup tool to make uploading images and mockups as easy as possible. If our mockup tool is down or you just want to take matters into your own hands, you can easily create one of your own! Head on over to our mockups page. If you have a different mockup you enjoy using that is a similar style to shirt you have chosen, feel free to use that instead! Find the template(s) that most closely resemble the shirt(s) you have chosen to sell your design on, and download the mockup file. Open the mockup file in photoshop. Our mockup files typically come with different color options, and different model options. 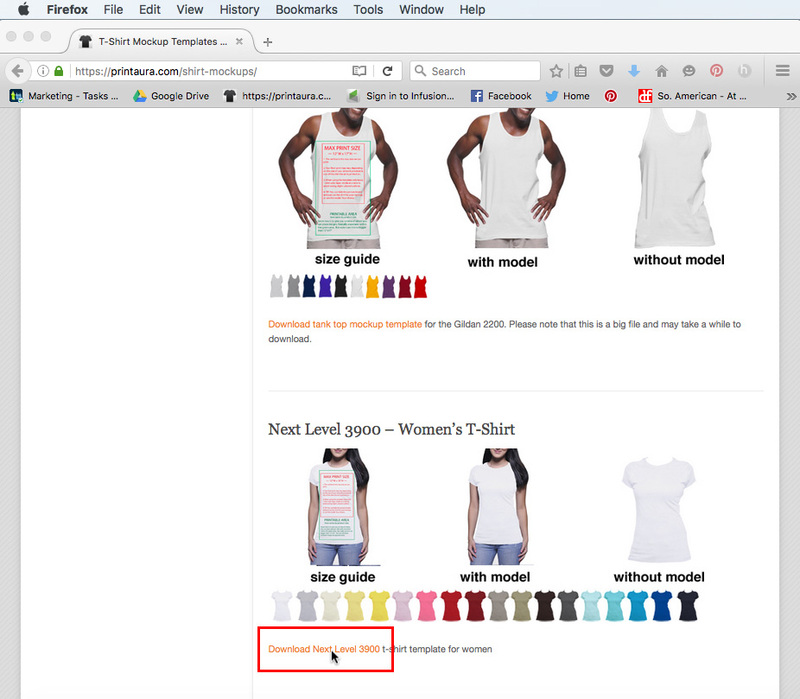 If you would like to use a color other than white, you can deselect the visibility of the white t-shirt layer. You can then find the color you want and select the visibility of that layer. You can active and deactivate the visibility of a layer by clicking on the little eyeball. If the eyeball is showing, it means the layer is visible. If there is no eyeball, it means the layer is currently invisible. Paste your artwork into the template and place it where you want your design printed. Make sure to keep it within the print area guidelines provided. Deselect the visibility of the guideline layers and save the file as a .jpeg or .png. You can now upload the mockup to my images on the Print Aura website and you’re done! If you have any other questions about creating mockups, or would like to see a video of how to do this, let us know in the comments down below! If you are looking for mockups for other products, check out our product pages for more mockup images. Here is an example of how to create a pillow mockup!